Commissioner Joseph Perry and Mr. Michael L. McCarthy, counsel to the District at swearing in ceremony. 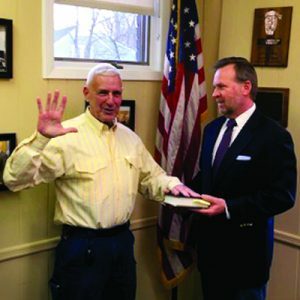 On January 2, 2019 Commissioner Joseph Perry was sworn in to his 3-year term as Water Commissioner with the South Huntington Water District as elected on December 11th. Commissioner Perry, a 10-year resident of Melville, began his term on January 1, 2019 and will serve through December 31, 2021.